Last Man Standing is returning from a brief hiatus with new episodes on Friday night, but while you gear up for it, why not hear from one of the season’s new additions? Actor Jet Jurgensmeyer has been playing Boyd, son of Kristin and Ryan as well as the grandson of Mike and Vanessa. This season has been about him coming into his own and starting to see where he fits within the world — while also getting guidance from a wide array of different sources. We’ve seen Boyd in a number of settings to date in season 7, and there are certainly more adventures and comedy to come for him. In a new CarterMatt interview, Jurgensmeyer talks a little bit about the road that led to him playing Boyd, including when he first learned he wanted to be in entertainment, how much of himself he sees in this character, his singing career, and why he’s optimistic about the future of the show. CarterMatt – We’re both pretty lucky in that I figured out when I was really young that I wanted to be a writer, and it seems like you were the same when it comes to being an actor and a singer. When did you first figure it out? It really all started then, and I would get up on stage and tell jokes for people and sing a song or two. Really, I just loved it and I wasn’t nervous. To this day, I talk people’s ears off and it’s just something that I do. We had some friends in the [country music] Mandrell family, and it was actually their mother Mary Mandrell who said to my parents, ‘he has that thing.’ They were like, ‘what do you mean? We know he likes to talk to people,’ and then she said ‘I think you can try acting with him. When I was four, I got my first agent who I still have to this day and I fell in love with it. Last Man Standing isn’t the first show that you’ve done, but how much has your life changed since being a part of it? Are there more people who recognize you and have you noticed a difference? Is there something you like about the energy of performing in front of a live audience? I know there are a lot of people who probably wish their shows were filmed this way since you can feed off of the crowd. Plus, it seems like this has been a part of your life from when you were very little. I love being in front of a live audience — it’s like you said, I’ve done it since I was little. I’ve fallen in love with it. I think I act better when it’s live. I think the show’s always better when what you see is done live. I’m always the dancer, so I’ll go and dance and sing with the crowd and keep them all hyped up. We also have this guy named Allan Murray who is amazing and keeps the crowd hyped up during the show, and then I’m always down there dancing and singing and talking to everybody. It’s what I love to do — I’m a performer! You are playing a character that had already been established on the show, but he was aged up for this season. How much of your own personality were you able to incorporate? There are certain things that I like to do. The one thing that is certainly different between us is that he doesn’t really say ‘yes sir’ or ‘yes, ma’am’ (laughs). That kinda drives me crazy, because I’ve always been taught that my entire life. That’s how I respond to adults. But, he’s a character and he’s different than me. But, we’re both teenage boys. We’re growing up, we’re getting taller, we’re noticing girls, we’re having school problems. There are all sorts of things that I don’t really mean to put into the character, but they just kind of happen. We’re both kind of the same — and we both love our grandparents. You and Molly were sort of the new kids on the block at first, but you’ve both been incorporated into the larger group now. Do you both feel like a natural part of the family now? 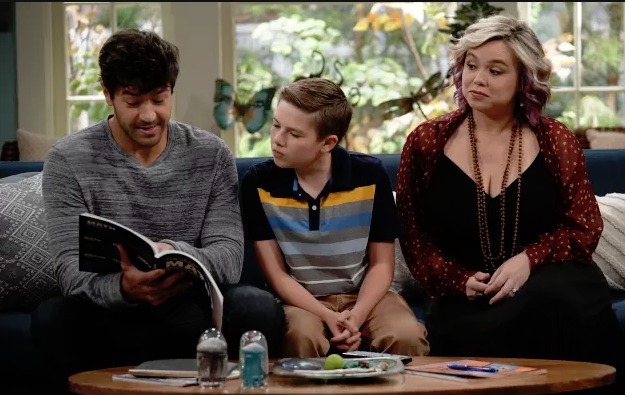 100% I was very lucky because the lady who plays my mom, Amanda Fuller, she actually contacted me through Instagram when they released who the new Boyd was and who Mandy was. She said ‘hey Jet, it’s Amanda, and I’m so excited to work with you and I’ll see you soon.’ I felt welcome before I was even on set! On set, everyone was amazing from back when I did my first fitting. Dave Cove, our first AD, is absolutely hilarious — the funniest guy. I think he can give Tim Allen a run for his money (laughs). There’s also Krista Marie Yu, who is new this season, and she is hilarious. I think I’ve learned a lot from the show and I still have a lot to learn. I’m not going to say I’m a total pro yet, but I have learned a lot from day one. How many episodes are you guys in to filming now? They just finished [episode 17], and they’re going on to 18. The week before this past Tuesday, the show was a very big show for me and Boyd. I’m really excited for everyone to see that one. It’s going to be super-funny. I know you do a lot of music, but do you have to flip a switch to go from acting mode to music? Or, are they really a part of the same brain? They’re all mixed in because I’ve been doing them for roughly the same amount of time. You’re a performer, really regardless of if you’re a performer or if you’re acting on stage. It is a little bit different, but not really when they’re both live audiences. On my YouTube, I post music videos and motivational videos, and I think that’s kind of fun since on my YouTube I’m able to talk to my fans a little bit more personally than through a script. But, I love them both since I get to entertain people and get feedback from people. So is there anything coming up over there that you want to tease? I post a video every Friday or Saturday on my channel, and every other week is a video where I’m just talking and giving tips on different things. I’m actually in the middle of editing my next video. I’m also doing a bunch of cover songs. In between acting and doing some home-schooling, I’m trying to figure out what my next video is going to be. I think it’s a lot of fun — it’s my version of filming an episode. I’m setting up my camera and my parents will say ‘hey, why don’t you say this in your next take?’ Then, I [film it] and then I go and add the music, the effects, and I think it’s a lot of fun. So with summer coming up and Last Man Standing wrapping filming [at least for now] in the spring, what are you looking to do in the time away? Do you like to constantly challenge yourself with new things? In a way. I do like to work on [my family’s] farm in Missouri, so I do like to come back here and have a different side of things than Hollywood or LA. It’s always nice to come home and release that. I do have a movie that’s coming out this year called The Legend of 5 Mile Cave that is on the INSP Network. I’m really excited about that. I got to go down to Toccoa, Georgia for that and see where the airborne men trained for World War II. It was so beautiful. I’ve got more music coming out — my album should be coming out later this year. One of the songs I wrote with a friend of mine in Olivia McKenna — be sure to go check out her music. She’s very talented and we’ve been friends since I was born. With Last Man Standing, the season’s almost over [in terms of filming] — we’re fairly confident it will be picked up, but I don’t want to jinx anything.